Any guy will tell you that title is the truth. Put a man in a good suit and he’ll feel like a king. Okay, if the weather is on the hot side he might also feel like a trussed-up chicken, yearning for shorts and flipflops, but on the whole a decent suit—especially one that is hand-tailored—will always make a guy look and feel good. 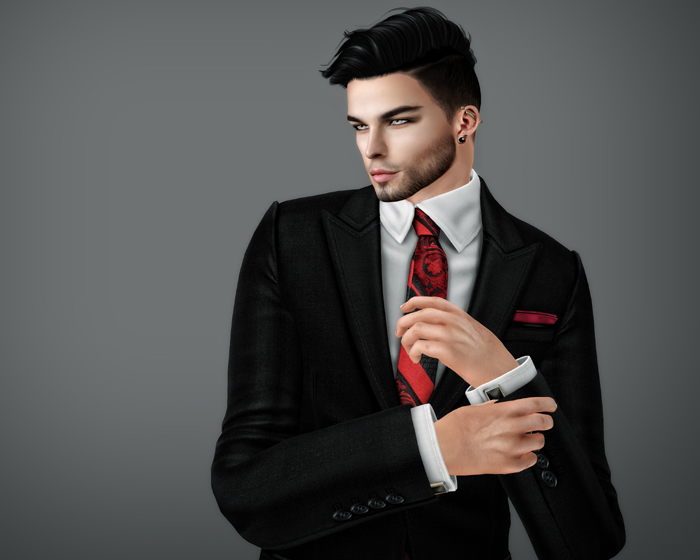 This Edge Business Suit from Lapointe & Bastchild—out at the current round of FaMESHed—is a stunner. It might seem a little on the pricey side, at L$1499 for a fatpack-only set, but, as with all L&B items, you get an incredibly-generous HUD with it that contains tens of options for the suit, shirt, tie, pocket square, belt, and metalwork. The only other thing I could have wished for was an option to colour/texture-change the cufflinks, not to mention that it’s unusual to see cufflinks used with folded-round cuffs instead of placed-together ones like these, but those are small quibbles when it comes to something this good. The tie and pocket square options range from 12 plain colours to mixed stripes to light plaids and this irresistible patterned design, with an on/off option for the pocket square. Suit fabric options contain 13 plain colours each for jacket and slacks, and you can bet that if L&B subsequently issue a pinstriped version I’ll be all over it. For the shirt your options are 26 plain colours and two striped (white/blue and white/dark grey). 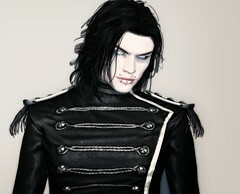 And, finally, for the belt you have 14 shades of leather and 5 metals, plus an on/off option. The suit jacket itself comes in both closed (shown here) and open single-breasted versions with peaked lapels. All things considered, that’s a lot of bang for your SL buck when it comes to a single outfit, and it’s tailored so beautifully. 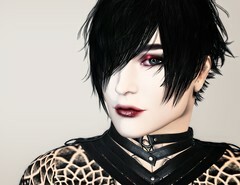 It’s available in fits for Slink, Signature Gianni, Belleza Jake, and a fitted mesh version for classic avatars. 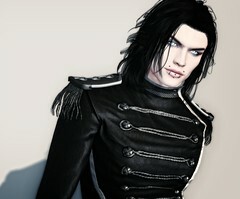 You can also buy the jacket separately (with the same amount of customisation) for L$899 at the event. 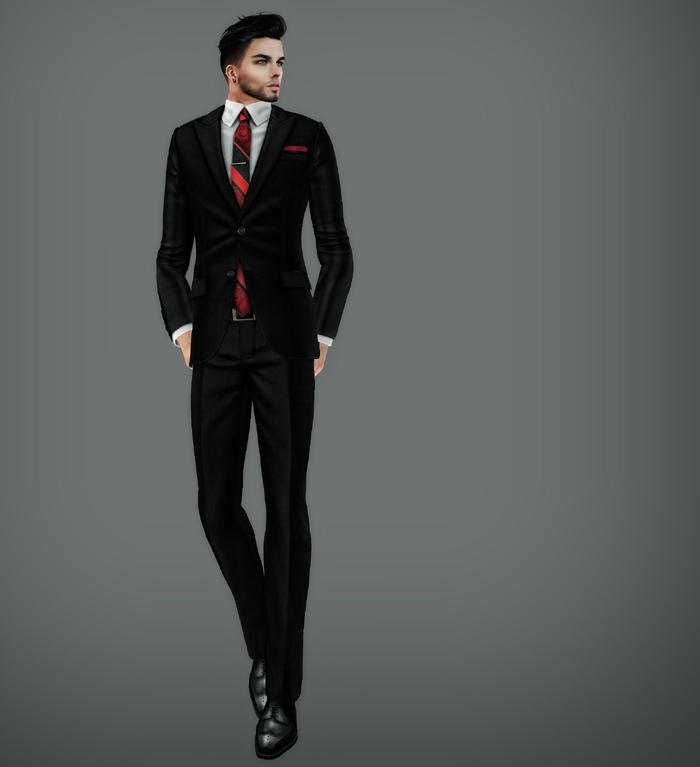 I’m wearing the full shebang, though, and with Deadwool’s classic Dandy Shoes which are a staple for me—together with their multi-height mesh socks—when it comes to suits in SL. 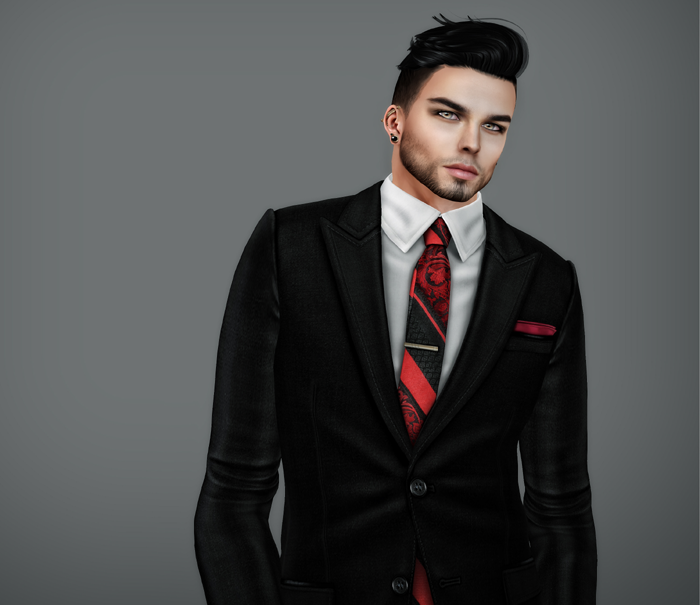 Hair by VoltHair, who have been bringing out some amazing styles of late, fierce (and yes, on fleek, etc) brows by Identity Body Shop, beard by CDC Creations, eyes by Avi-Glam, and head by Catwa.